Png - Portable Netwok Graphic. Use RadChart.ExportToImage(Stream). Bmp - Bitmap file. Use RadChart.ExportToImage(Stream, BitmapEncoder) where the encoder is of type BmpBitmapEncoder(). ExcelML - ExcelML file, supported by Office 2003 and above. Use RadChart.ExportToExcelML(Stream). Xps - XML Paper Specification file. Use RadChart.ExportToXps(Stream). In WPF there are overloads for the methods listed above, which take as parameter the name of the file you want to export to, instead of a stream. This allows you to easily export your chart directly to a file. The following example demonstrates how to export RadChart to ExcelML file format. 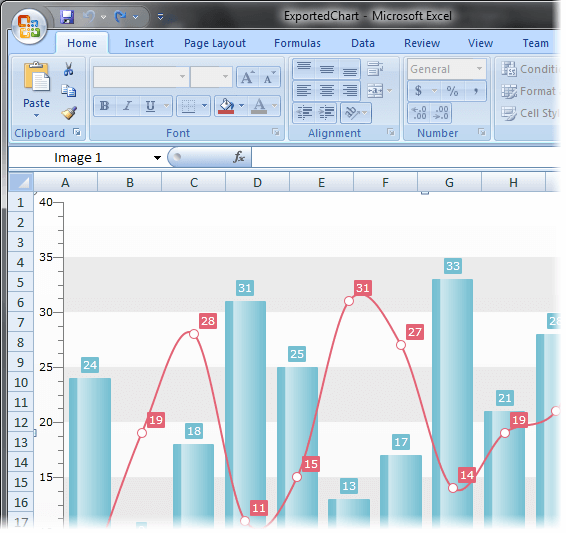 The snapshot below shows the exported ExcelML file loaded into Excel.